Infrared heaters, like all electric heaters, can be installed quickly and easily, with none of the expense of installing plumbed heating systems. Plug-in infrared heaters for indoor use can be installed DIY, a simple job that can be achieved in ten minutes. 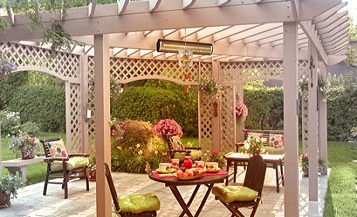 Hardwired heaters and patio heaters for outdoor use must be fitted by a professional electrician. Panels mount on the wall like a TV or picture frame. You can plug them directly into an ordinary 13amp socket. A quick job for a professional electrician. Provides a more discreet fitting with all wires hidden. Required in bathrooms or other wet areas where you can’t have sockets. Some infrared heaters come with a plug, and can be fitted DIY. Others do not, so must be hardwired, or fitted with a plug. Infrared heaters in bathrooms and other wet areas must be hardwired for protection. Always check manufacturer installation guidelines and IP ratings for any product intended for bathroom use. Warehouses, workshops, factories and other industrial locations will usually benefit from a hardwired fitting. Outdoor heaters must always be hardwired to protect against water ingress. This is a quick job for a qualified electrician . Most infrared heaters don’t come with in-built controllers. This is to extend the lifespan of the product. 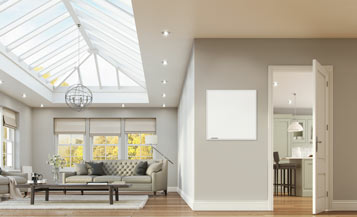 Infrared panels, for example, are designed to last for decades, with durable heating elements which will inevitably last longer than the electrical components inside thermostats and timers. Purchasing separate controllers also gives you the flexibility to update your heating control system as and when new technology is developed. We always recommend installing your heaters with some form of controller, to help you save energy whilst ensuring comfortable heating levels are maintained. Timers offer the most basic level of control. Once you activate the heater, it will stay on for a set amount of time before switching off. Can be activated by a button, dial or motion sensor. Remote control timers allow you to adjust your heating from a distance, using Bluetooth, wireless or radio, via a dedicated remote control or an app. Hardwired and plug-in thermostats connect directly to the heaters they control. They monitor the room temperature and switch the heaters on and off to maintain temperatures. Wireless thermostats control multiple heaters from a central thermostatic unit using a radio frequency. 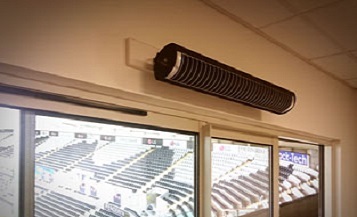 Each heater is wired to a receiver which intercepts signals from the central thermostat, which tells the heaters to switch on and off to maintain set temperatures.